a little good 'ol fashioned empowerment. so much as the number of times you get up. C'mon girl, you got this. Radiant Magazine is the first by Catholic women, for Catholic women magazine. Radiant covers traditional topics of the Catholic Church and applies them to the lives of young women living in a modern world. Verily Magazine is an online platform for all things women's empowerment. Find dozens on blogs on fashion, beauty, relationships, culture, health, and lifestyle. 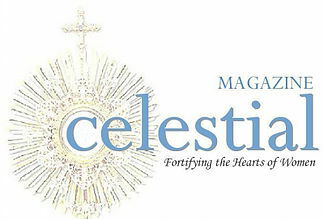 The mission at celestial magazine is to help deepen your encounter with Christ and strengthen your relationship with Him. Walking with Purpose is a Catholic Bible study program that aims to bring women to a deeper personal relationship with Jesus Christ. They offer personal study and small group discussion that link everyday challenges and struggles with the solutions given through the teachings of Christ and the Catholic Church.